cyanogenmod 5.0.8 – Jane Talks Tech! I‘ve been using my Android phone (G1) for a little over 2 weeks. Since then, there have been several dozen apps downloaded and discarded by yours truly. In the post, I’ll do a brief rundown of several apps that have persisted throughout my numerous wipes (akin to reformatting and reinstalling in the Windows world). and checking the Android app out on Cyrket or AppBrain which are sites for viewing comments/ratings of apps. That is the mapping application, Ndrive. 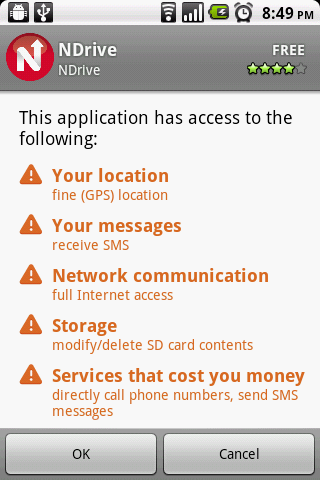 Expectedly, it’s going to access my location, download maps to my microSD card, enable functionality that involves accessing my messages, calling, etc. Things you’d expect an app dealing with navigation to do. The other application displayed is the Factbook app which is expectedly accessing the internet and while I’m not sure why it needs my location, I’m not too bothered by that. The point is: If you’re downloading a wallpaper app, I’d only expect to see it accessing my microSD card to deposit the images or check online for updates to the images, etc. If you see a metric ton of things being accessed that you don’t expect it to, feel free to hit “cancel”. Google Addons provided with CyanogenMod v. 5.0.8. Note: This ‘package’ is installed by default on a stock Android ROM, but for users of non-stock ROMs, be aware that you’ll need to download this pack which can’t be legally bundled with the ROMs; Hence, the separate bundling but I realize this pack isn’t an “app” you install or buy in the usual way. 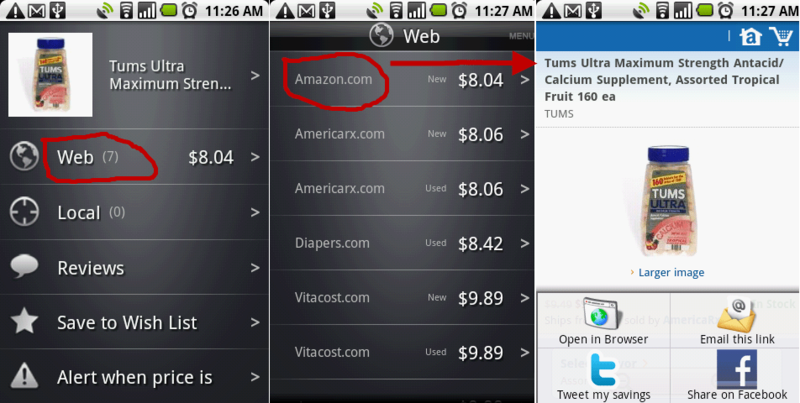 Here are some of Matt Cutt‘s current/favorite Android apps. You might find something new! One of the first things I do with new computers/phones is make sure I have a capable backup system on it. MyBackup Pro (Cyrket Overview) fit the bill from all online accounts/reviews. It backs up my data and apps like a champ to my microSD card.However, I have since discovered something very troubling about this application. This issue concerns the online backup aspect of this app, but it shouldn’t affect owners of new/unused Android phones. Basically, if your used Android phone has ever had MyBackup Pro + an email address + password associated with it, you have a privacy problem. Basically, on a virgin installation on MyBackup Pro, new users are prompted to create a password and associate an email address with the application. If you weren’t the one who set up the MyBackup Pro application (which will happen if you’ve purchased a used Android phone from someone relatively savvy), you’re stuck with their password and if you’ve used your email address in corresponding with the previous owner, guess whose online backups can be accessed on MyBackup Pro’s servers? Yours. My instinctive response was: change everything (my PIN, password and email address). First, the PIN is “hardcoded” and can’t be changed. According to the MyBackup Pro representative, the password couldn’t be changed either! Finally, the representative admitted that he could change my password manually and again, I cringed. I subscribe to the concept that a password should be known only by 1 person especially for something private & important? I mean, the app backs up SMS messages, call logs, calendar events, et cetera. Short and sweet: Don’t use the online backup aspect of MyBackup Pro until there’s an easier way to reset/change passwords and change the associated email address. Back up your important data to your SD card and even more importantly, copy the backups to an external hard drive and keep them safer that way. To be clear, the MyBackup Pro representative I was in touch with was able to manually change my password, but I imagine that method won’t scale. Short and sweet:Use this recovery image as your Swiss Army knife. I’ve detailed why I went with the Amon Ra recovery image over the Clockworkmod recovery image for my version of CyanogenMod. You can get into the console and also get into your microSD card while booted into the Amon Ra recovery image. Short and sweet: Voicemail on steroids: faster, more accessible and it configures your voicemail settings on your phone automagically. Google Voice recently became available for all US/Canada users to sign up for so there’s nothing stopping you from getting an extra voice number which accepts calls, can transcribe your voicemails (extremely beta feature so you’ll still need to listen to your voicemails, can email text messages sent to that number) to your designated email address, and much more. This is an invaluable service provided by Google. Short and sweet: I’ve always had a file manager on every single phone I’ve owned. 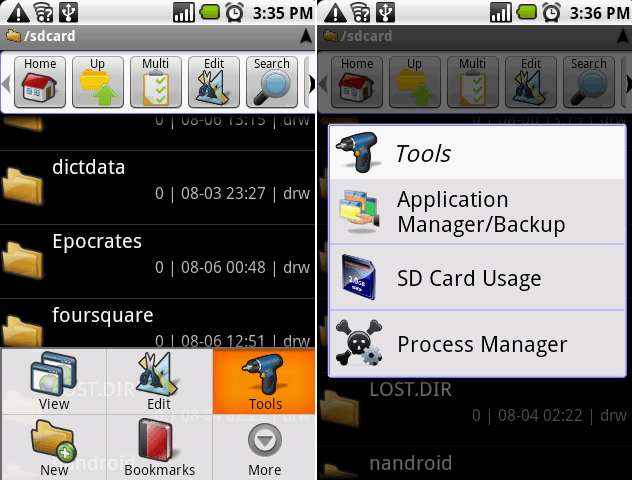 For the Windows Mobile ecosystem, the file manager to beat was Resco’s Explorer. On the Nokia E71x, the best file manager was X-plore and now, with the Android phone, Astro File Manager has cornered this niche market. There’s a free version of the Astro File Manager, but I always like supporting well-done and relatively inexpensive applications like the Astro File Manager. Astro File Manager Pro comes with goodies like an application manager (allowing you to uninstall apps), backup your .apk files for the apps, a way to visualize your SD card’s use and a handy process manager tool. Short and sweet:: Best free dictionary available for the Android system. For my needs thus far, the ColorDict app and free Dictionary addons available are more than adequate. Wikipedia Addon: It’ll pull up info about the entered word from Wikipedia and if you aren’t connected to the internet, it doesn’t miss a beat in continuing to display info from the other dictionaries. Short and sweet:: Barcode Scanner is the fastest way to scan a barcode or QR code and get what you want: If you use barcode scanning more for shopping and like a little more eyecandy, the ShopSavvy Barcode Scanner will be more your speed. 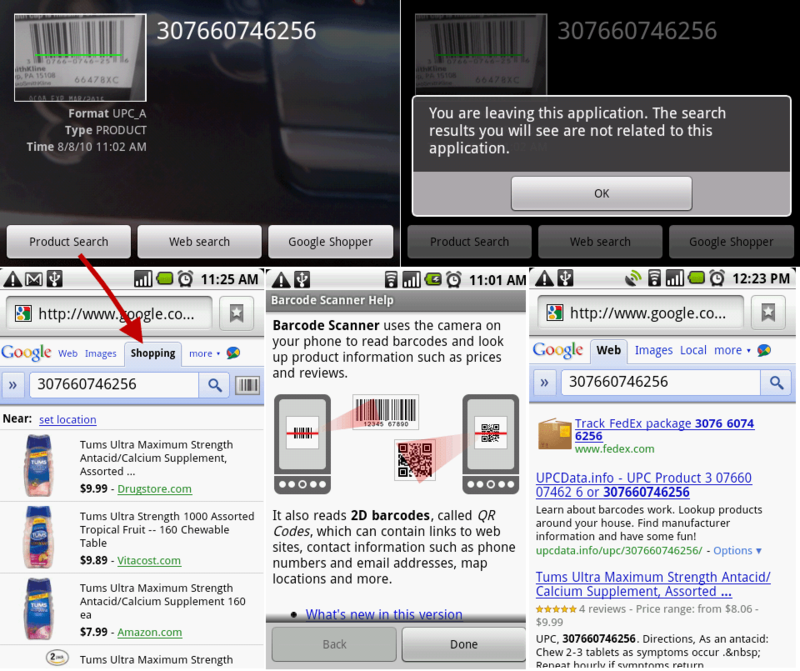 If you search the Android Market for scanners, you’ll find that the Barcode Scanner app by ZXing and Shopsavvy are the 2 highest rated “barcode scanning” apps on the market. From barcode labels on any products to computer-generated QR codes, these apps are great for easily visiting a website/url, calling a number or downloading a .apk file (apk stands for android package). Frankly, you won’t go wrong with both apps on your phone. It won’t hurt a thing especially if storage is not a problem for you. Hence, I recommend an 8gb class 6 microSD card or a 16gb class 6 microSD card on Amazon.com. Personally, I don’t use this too much because the camera on my G1 is pretty pathetic. However, with newer and better cameras shipping with cellphones these days, I think having an app that does neat tricks with photos is indispensible. This is a paid app and it cost less than $7. 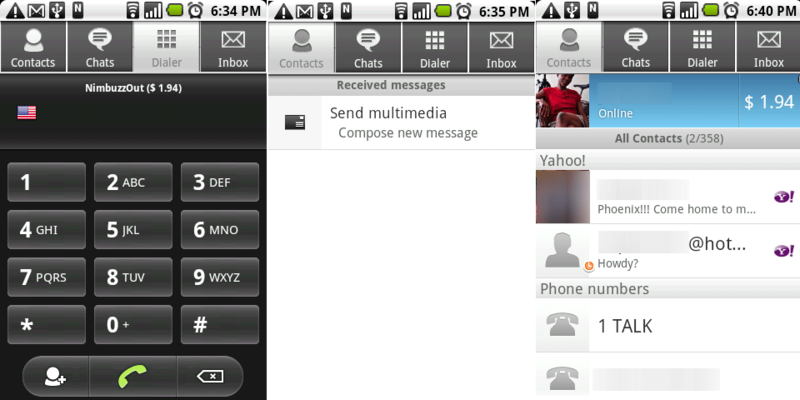 Short and sweet: Nimbuzz is an all-in-one instant messaging application and voip client as well. I currently use it to keep in touch with contacts on the following networks: Skype, Facebook, Windows Live, Gmail, and Yahoo Mail. 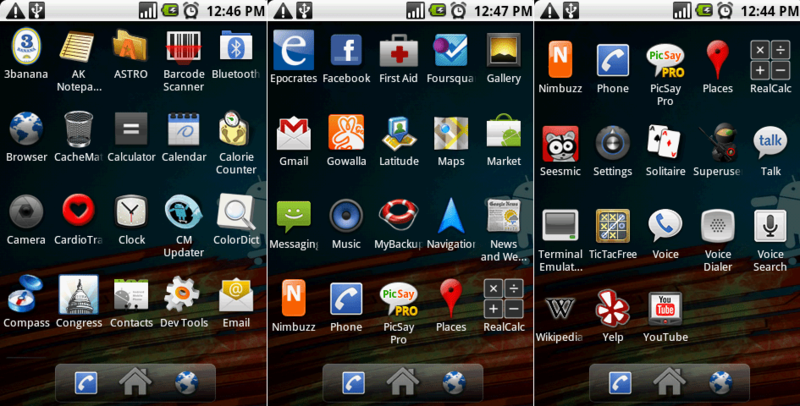 I’ve used Nimbuzz with the Symbian S60 system (my Nokia E71x phone) and I’ve just been blown away at how much better the Android apps are compared to the S60 ecosystem. C’est la vie. 🙂 Get Nimbuzz now and as always, it helps to have a data connection because the app runs in the background to notify you of chats, incoming messages, etc. I had a hard time with not straying from the “persistent apps” theme, but I think that’s a good place to start from when attempting to figure out what apps are important or could be of frequent use to you. Cheers and I’d love your input on *your persistent Android apps. Install the latest JDK version from Sun Oracle. Download the Android SDK. It’s a zipped file that doesn’t need installation so just unzip to a directory of your choossing. Browse to the “Tools” folder of the unzipped Android SDK folder and doubleclick the ddms.bat file. 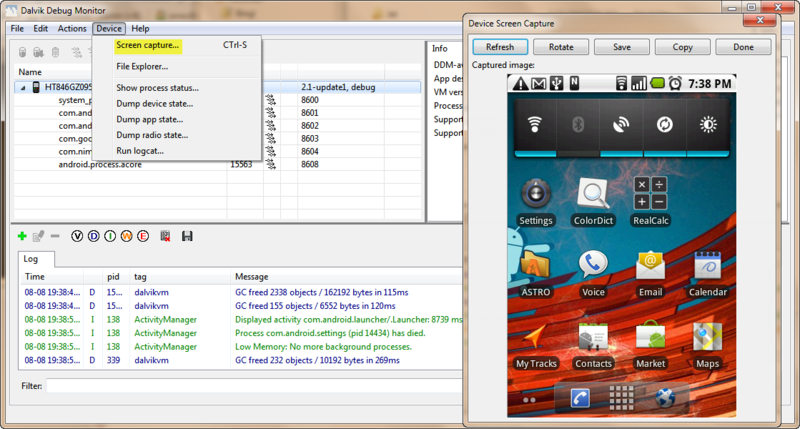 After clicking on the ddms.bat file, you should see the Dalvik Debug monitor window pop up. 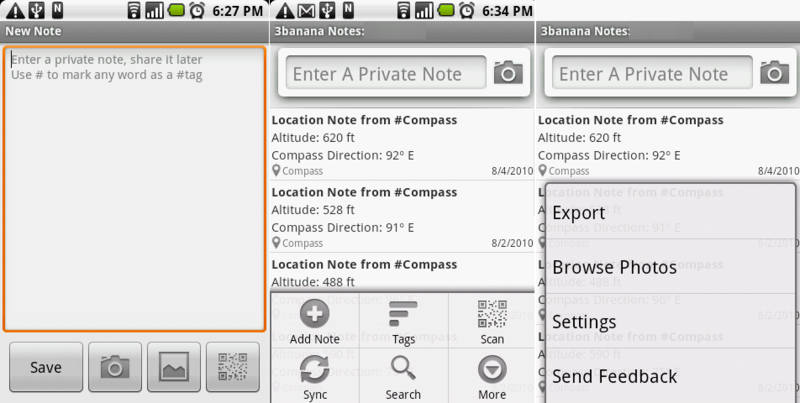 Navigate to “Device” and click “Device Screen Capture”. See the screen capture at the end.